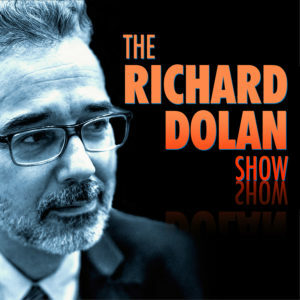 This is PART TWO of a three-part series of interviews with Frank Feschino on the Richard Dolan Show. Feschino provides extensive detail regarding the legendary “Flatwoods Monster” UFO incident of September 12, 1952. This interview is exclusive at richarddolanmembers until it is released publicly on Youtube Monday, April 8. Here, Frank discusses the details of the forced landing in Flatwoods, West Virginia. This is a step by step walk-through of the incredible event, as well as the lesser-known encounter the following day in Framewood, West Virginia. This is where several individuals encountered the being associated with the downed craft. PART ONE discusses the astonishing “Shoot Them Down” background to the story. Feschino demonstrates that the Flatwoods event was one of four major incursions of U.S. airspace by unidentified flying objects. These craft were fired upon by the U.S. Air Force. 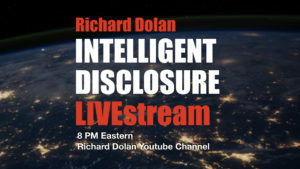 PART THREE (available soon only at richarddolanmembers.com) covers the extensive background to Frank Feschino’s 25-year investigation of this extraordinary event. Absolutely fabulous insight and detective work!! Brilliant!! This level of detail makes this case stand out as one of the most interesting cases ever. Wow!! Thanks Frank and Richard!!! After watching this episode I can honestly say that not since,” The Odyssey” a sequel to Homer’s “Iliad” has a sequel surpassed the original, including that of The Dark Knight(2008)and Terminator 2(1991). It became obvious straight away that this case was so meticulously investigated and well reconstructed that it left me with only a few questions. It correlates a lot with Ivan Sanderson’s 1953 boots on the ground report but suggests the craft was only one of 6 in that area that night 2 of which came down. Sanderson also suggested the oils is a natural occurrence of the are and the grass? Not sure about that. Has Frank Feschino seen that interview and what is his interpretation regarding the evidence presented in it? Frank Feschino should have investigated the ‘Maury Island incident’ the correlations with this case would suggest perhaps the Army Air Force may have been shooting at things a lot earlier than 1952. I can only say that after seeing this the investigative works of Frank Feschino are unequaled. Proving again you don’t have to have a Ph.D. in Nuclear physics, be an Emmy winning reporter or retired from the M.O.D to be a great researcher and seek the truth. Way to go Frank! Another great man looking for the truth in a sea of deception. I truly wish I was as educated as yourself Mr. Dolan, and just to let you know, it was my intention to denigrate the individuals I mentioned above, there abilities and character are also beyond approach. I was just trying to encourage others that any individual can do extraordinary things if they put their minds to it. I’m always worried my language may be misinterpreted. No need to reply but always humbled by your replies, thank you. Wild story, well told by Frank Feschino and great detective work in uncovering and putting all the pieces together. I loved doing the interview with him. There’s a 3rd part to be released very soon. Absolutely worth the wait ! Thank you for all the hard work Richard and Tracey ! This was brilliant. I bought the book but have not started to read it. Just incredible how several sightings related to flatwoods. Bravo!!!!! Proud to be a member. Could the “monster” been an escape pod? Amazing! Almost every facet of this case! From the aerial prelude near Florida and the eastern Atlantic coast , the dearth of public awareness despite the great scale of the ground close encounter, to the documented confirmation by military authorities. First of all, salute to those missing airmen where ever they are or whatever became of them. As an Air Force veteran myself, my heart goes out to them, their families, and comrades. I had *never* heard of this case before the ‘Project Bluebook’ television episode from this past winter. Now, hearing Mr. Feschino’s impressive and amazing investigation, I feel like I still knew nothing about it. The 1952 Washington DC Incident has always been a favorite case of mine. The Flatwoods Encounter happening 6 weeks later, with at least one UFO converging on D.C. again…Whoah! And I agree with Mr. Feschino’s conclusion about the tactical posture of the other two UFOs. It was a message. And it seems like our government understood and acquiesced. Back off. Don’t challenge the search & rescue operation. Was there a connection between the D.C. Incident(s) of late July ’52 and Flatwoods 6 weeks later? Repeated approaches by numerous foreign craft in the most restricted national airspace, then blood drawn by both sides soon thereafter. It makes me wonder what was the cause for the D.C. show of force(?) from these beings. It’s reminiscent of the many close calls that NATO & Warsaw Pact nations had during the Cold War. Many of those were covered up, too. Richard, I am very much looking forward to Part 3. I’m amazed. I had to buy Frank’s book looking forward to the read, most interesting case indeed, I am very impressed with his commitment to the case. Looking forward to part three! Well done! Amazing case! One of the best. Great job Frank!! This is the most interesting, and in depth, case I have heard yet. The level of detail and recall that Frank retains is impressive. Talk about having a specific reason and purpose for someone to be here, this is Frank’s calling in life. It is good to see someone with his passion to get to the truth of just one, specific case and sourrounding events. He seems to be a very down to earth guy, and he takes his research to the extreme, which is admirable. I wish I had that much passion and drive for a subject. It amazes me, how people just dismiss these cases of UFO and paranormal stories as a joke, and it seems to me that Frank feels some irritability that not everyone takes this more seriously. I mean, even though more of these UFO cases can be explained away than not, there are cases that are truly unexplained and deserve attention to try to get to the truth as best as we can. Awesome interview, and can’t wait for the third installment. Of course, as I always seem to do with this interesting subject of ufology, the purchasing of both of Frank’s books are on my list to read! Great stuff! Amazing content as ever but this case is just so fascinating and in these 2 videos Frank really opens the case up and his years of work shine through. This may be one of the most important events in the lost history we are trying to recover. The scenario as I see it seems to be a shoot down followed by controlled landing and then rescue. The being seems to have exited the craft either out if fear for its safety or to search the area for others of its kind. Total encasement in a suit of some kind with no ground contact implies something in our environment to be dangerous or the fear of it. Curious to know – have there been other cases with reports of the ‘oily’ substance and beings apparently inside of levitating suits? I don’t recall any at all. Thanks Rich – Enthralled that you finally snagged Frankie into doing your show! Great anticipation for the final round up with him!!! Just outstanding conversation!